Turkeys can be a fun, profitable addition to a small farm or homestead. They are usually raised for meat, although some people like to keep a "tom" (a mature male turkey) around as a pet. Before you decide to add turkeys to your farm, here are the basics on raising them the right way. If you've raised chickens for eggs or meat, turkeys are similar — but they require a bit more babying, especially as poults (young turkeys). They are also social with humans, much more so than chickens, so you'll need to be willing to spend some time with your birds every day. Broad-breasted Whites are the "modern" eating turkey, similar to the ones you find in the supermarket (but even this breed, raised on pasture on a small farm, will taste far more flavorful than the supermarket variety). Standard Bronze and White Holland varieties are also popular breeds for meat production. Broad-Breasted Bronzes and Whites are not actual breeds, just a non-standardized commercial strain used for meat, while White Hollands and Standard Bronzes are recognized breeds. Heritage turkeys include Bourbon Reds and Narragansetts, which are striking, medium-sized birds that excel at foraging and pest control. Royal Palm turkeys grow to a smaller finished size of roughly ten to sixteen pounds and are beautiful, different-looking birds. Typically, you will be starting with day-old turkeys in the spring, called poults. You will need to set up a brooder area (link) just like you would for chickens. There are lots of do-it-yourself ideas for brooder areas, from a feeding trough to a kiddie pool. Just like starting chicks, you will need to keep the brooder area between 90 and 100 F for the first week, then slowly lower the temp by raising the lamps, cooling it by 5 F each week. Many of the same places that sell chicks also sell turkey poults. Many farmers let their turkeys live outside on range in a large fenced pen with a movable roost assembly, much like a movable chicken coop. The best range for turkeys is short grass, four to six inches long. Red clover and Kentucky bluegrass are especially good grasses to have on the range. 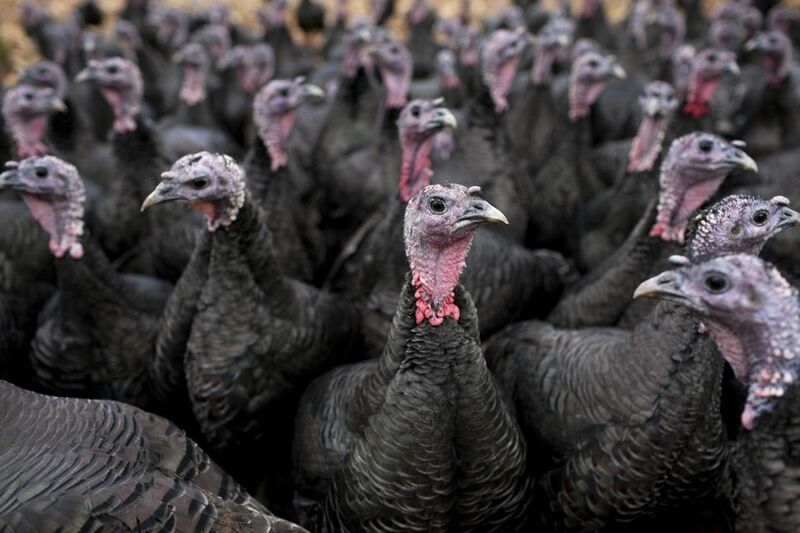 For a flock of a dozen turkeys, plan to build a pen of roughly 75 feet square, or one-eighth acre. Make sure your fence is secure from coyotes, foxes, raccoons, and even bears — all of whom would love free-range turkey dinner. Woven wire fencing is a great choice, as is electrified poultry netting. Keep the pasture fresh by moving the portable roost to clean ground weekly. You can also rotate the location of feeders and waterers to prevent manure buildup. For a dozen turkeys, you'll need at least 2 gallons of water every day, so consider an automatic waterer connected to your outdoor water spigot. A four-foot-long waterer will suffice for 12 birds. Many turkey farmers build a wooden range feeder with a little roof on top to hold the feed. A feeder that holds about 100 pounds of feed is a good size for 12 turkeys, as by the time they near maturity they will each eat a pound of feed a day. Learning how to prevent health problems before they arise — with clean pasture, movable roosts, and fresh, clean water and food — is the easiest way to handle raising turkeys. Still, sometimes things happen and you'll need to know how to take care of them. Give turkeys enough roosting space and pasture. Make sure to raise them separately from chickens. 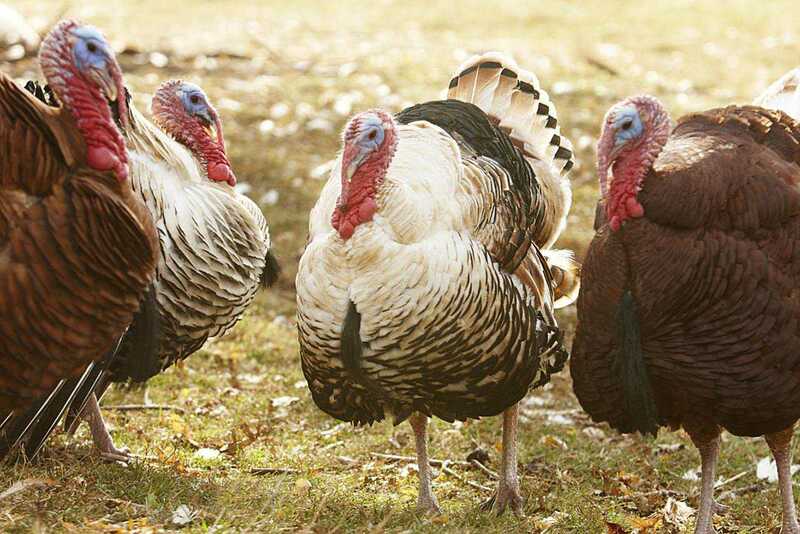 Ensure your turkey house has good ventilation, and protect your turkeys from predators. If you're keeping turkeys for meat, the time will come to slaughter and process them. The steps are much the same as slaughtering chickens. You will simply need a bigger killing cone and make sure the scalding pot is big enough for your largest turkey. If you want to try to breed your own turkeys, keep one "tom" for every 10 hens. In the spring, your turkey flock will naturally expand. If you end up with extras, you can sell "trios" (a tom and two hens) to other local farmers and homesteaders.